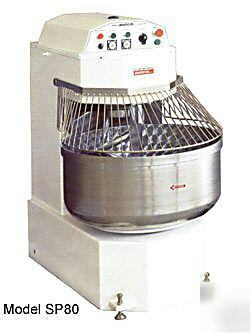 The SP 10-60 models are spiral mixers with bowls made of stainless steel. They feature fixed stainless steel high strength spirals as well as a safety device which stops the machine when the bowl cover is lifted. These machines will greatly reduce the usual mixing time of traditional machines. Ideal for bakeries and pizza shops, these mixers performs well with both hard and soft dough. The SP80 and SP 100 models are heavy-duty spiral machines with fixed basins made of stainless steel and include a rear basin guard. These models are equipped with two kneading speeds, two timers to program the working cycle and contain two fixed wheels and adjustable feet for easy positioning. Larger capacity models are available upon request. MAKE CHECK OUT TO: DIAMOND EQUIPMENT INC. 11750 PARK BLVD. SEMINOLE, FL. 33772. ALLOW (5) BUSINESS DAYS FOR CHECK TO CLEAR OUR BANK.